Yardbird is situated within one of Belfast’s oldest buildings above The Dirty Onion Public House in the heart of the Cathedral Quarter on Hill Street, Belfast. 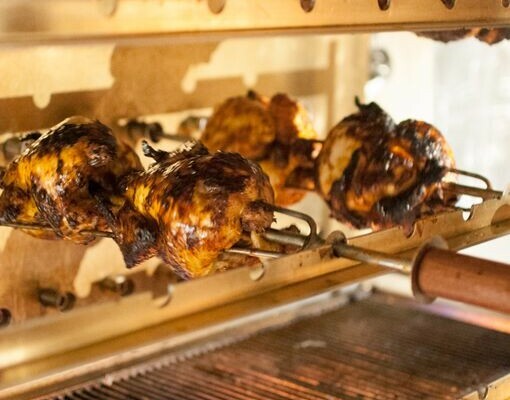 Yardbird, a free-to-roam rotisserie chicken restaurant, is a firm local favourite in its own right as well as a being a perfect complement to the cosy bar downstairs. The simple, stripped back and uncomplicated menu is prepared and delivered to the highest standards and served in a unique style with a matching environment. The food offering is straight to the point, rotisserie chicken, ribs, wings, and sides, all cooked to perfection and full of flavour. Although the restaurant is situated above The Dirty Onion public house, the restaurant offers a family friendly atmosphere where everyone is welcome, just so long as you love chicken!